Welcome to team Mile Highdrogen’s homesite. The details concerning the design and build of the vehicle are portrayed throughout the site. Please feel free to browse and learn about the struggles and accomplishments of the members of this team. 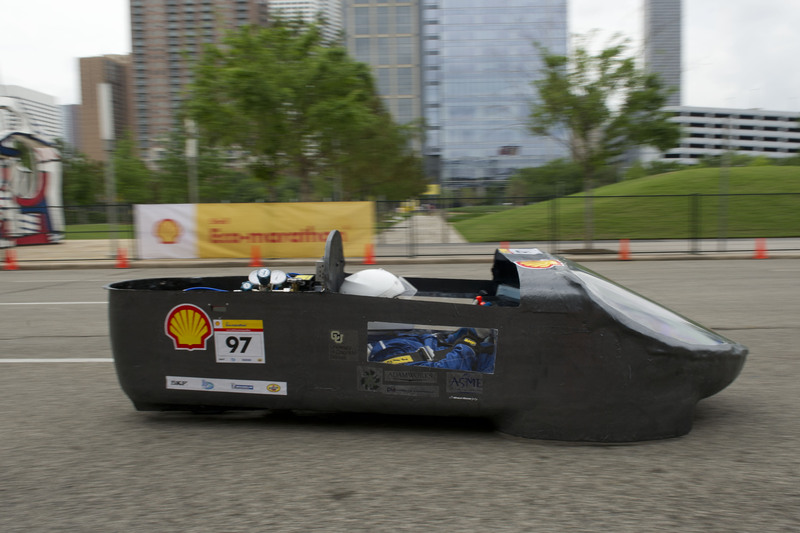 The 2013 UC Denver Hydrogen Ecomarathon Team! We are so happy to know that this year’s senior design class has a team competing in the same event as we did. We wish them the very best in competition and to learn from our mistakes to start a winning tradition for the university! The team members of Mile HIghdrogen can honestly say that this project was one of their biggest accomplishments. Not only were they able to design, build, and compete a functioning vehicle from the ground up in a span of less than 7 months, they were able to create new resources for the future students at the Auraria Campus. The campus consists of two universities and a community college and with the research and purchase of the Hydrogen fuel stack, it opened new doors for research and development on campus. With the help of the Sustainable Campus Program of Auraria, the fuel stack can be accessed and used by 30,000+ students from the three schools, through the Auraria fuel cell program. A program of this nature has not been available to the campus until now, where different students can research and develop new innovations using the fuel cell. The team was also able to lend a helping hand into the creation of a new program of study at the UC Denver School of Engineering. Motorsports Engineering will provide undergraduate and graduate programs of study for future students to gain knowledge of the automotive industry. The college of engineering releases an annual magazine, Impact, that showcases the projects and students of the University of Colorado Denver Engineering program. We would like to extend a big thank you to Erica Lefeave of the UC Denver Engineering department for spending the time to research and write this article about our team and project, that turned out to be one of our biggest accomplishments. Please click the link and scroll to page 10 to begin the article. Below is the video reflecting upon our year of designing, building, tears, and smiles. We would like to take this opportunity again to thank all of the faculty at UCD, and all of our sponsors and supporters along the way. This project would have not been completed without everyone’s assistance.